For other uses, see Marksman (disambiguation). A marksman is a person who is skilled in precision shooting using projectile weapons (in modern days most commonly an accurized scoped long gun such as designated marksman rifle or a sniper rifle) to shoot at high-value targets at longer-than-usual ranges. In popular and historical usage, "sharpshooter" and "marksman" are considered synonyms. Within the shooting sports and military usages today, however, sharpshooter and marksman refer to distinctly different levels of skill, which are never conflated. Specifically, in the US Army, "marksman" is a rating below "sharpshooter" and "expert". Four levels of skill are generally recognized today in both military and civilian shooting circles: unqualified, marksman, sharpshooter, and expert. Marksmanship badges for the three qualified levels are commonly awarded to both civilian and military shooters who attain proficiency in shooting higher than "unqualified". The main difference between military marksmen and snipers is that marksmen are usually considered an organic part of a fireteam of soldiers and are never expected to operate independently, whereas snipers usually work alone or in very small teams with independent mission objectives. Snipers are also often tasked with responsibilities other than delivering long-range fire — specifically, conducting reconnaissance and directing coordinates for artillery fire or air strikes. Within the military, marksmen are sometimes attached to an infantry fireteam or squad (where they are known as designated marksmen) where they support the squad by providing accurate long-range shots at valuable targets as needed, thus extending the effective tactical reach of the fireteam or squad. In the Middle Ages, in the first use of the term 'marksman' was given to the royal archers, or bowmen, of a palace guard, which was an elite group of troops chosen to guard a royal palace or the royalty. This was around the 10th century, although records of some 9th century English Kings show the listings of groups of marksmen specifically chosen for their militaries. In the Australian Army, marksmanship is currently recognized by the award of one of three skill-at-arms badges. The 'Skill at Arms Badge' consists of a representation of crossed .303 Short Magazine Lee–Enfield (SMLE) rifles and is awarded for achieving a prescribed standard of shooting skill. This must be repeated within twelve months for the badge to be awarded in perpetuity to the recipient. The 'Sniper's Badge' is similar in design but incorporates the letter 'S' into the design and is awarded to soldiers who qualify on the Army Sniper's Course. The 'Army Top 20 Badge' consists of crossed .303 SMLE rifles upon a laurel wreath and is awarded to the final 20 competitors in the annual Champion Shot for the Army. The winner of this competition is also awarded the Champion Shots Medal. Only one badge may be worn. 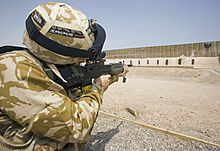 A British soldier aims on a shooting range in Iraq, 29 July 2006. In the United States Army and Marine Corps, the marksmanship of the soldiers is ranked based on their skill: marksman-sharpshooter-expert. Holders of each level wear qualification badges below their ribbons with bars for the weapons they qualify in. In the United States Navy and the United States Coast Guard, full-sized medals are only issued at the expert level. Both services award separate medals for pistol and rifle proficiency. The United States Air Force gives just a ribbon for qualifying at the expert level, although a bronze star can be earned if the wearer qualifies on both of these types of small arms. U.S. Army soldiers fire a FGM-148 Javelin, 16 August 2006. 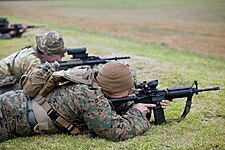 Within the United States military, a marksman in the U.S. Army is referred to as "Squad Designated Marksman" (SDM), and a marksman in the Marines is called a "Designated Marksman" (DM). The United States Army particularly emphasizes the fireteam concept: according to US Army Field Manual 3-21.8 (Infantry Rifle Platoon and Squad, formerly FM 7-8) a typical United States Army fireteam consists of four soldiers. In the context of a Stryker Brigade Combat Team (SBCT)'s Infantry Rifle Companies, one man from each fireteam in a rifle squad is either the Squad Anti-armor Specialist (RMAT), armed with the FGM-148 Javelin, or the Squad Designated Marksman (DM), who carries the M4 carbine and M14 rifle. In both cases this specialized function replaces the basic rifleman position in the fireteam. As with other Commonwealth armies, the Marksman in the Canadian Army is a shooting achievement recognized by a badge bearing the monarch's crown and crossed .303 Lee–Enfield No. 4, Mk I rifles. On operations within the Canadian Infantry Battalion, rifle company designated marksman can be assigned. This is not to be confused with Canadian snipers, who attain a high level of marksmanship and fieldcraft through in a very grueling selection course and must achieve a recce qualification and marksman before being considered for the basic sniper course. The Indian Army uses a locally manufactured licensed variant of the SVD Dragunov in the Designated Marksman role as part of each infantry platoon. The Dragunov is used in conjunction with the INSAS family of weapons to give flexibility and striking power at short to mid range firefights, to Indian Army infantry units engaged with opposing forces. The United States has a long tradition of marksmanship going back to its beginnings including the role of common men in its Revolutionary War. There are several organizations which promote civilian marksmanship including the Civilian Marksmanship Program which began just after the turn of the 20th century as a government chartered program and the Division of Civilian Marksmanship. One of the newest and currently the fastest growing marksmanship programs in North America is Project Appleseed which was started by the Revolutionary War Veterans Association in 2006. Shooters who score 210 out of 250 or better on the "Quick and Dirty" Appleseed AQT earn the Rifleman designation and are issued a Rifleman patch. Similar to the U.S. military marksmanship ratings of Unqualified, Marksman, Sharpshooter, and Expert (see Marksmanship Badge (United States), the Appleseed ratings have the same levels, with the exception that instead of "Expert", the equivalent performance level is called "Rifleman". The National Rifle Association of America (NRA) is an American nonprofit organization founded in 1871 that sponsors marksmanship events featuring shooting skill and sports. M21, the scoped and accurized version of the M14. ^ a b "Marksman". Dictionary.com Unabridged (v 1.1). Random House, Inc. Dictionary.com. Retrieved June 8, 2008. ^ "MERRIAM-WEBSTER DICTIONARY: "Marksman"". Retrieved November 22, 2016. ^ "Roget's 21st Century Thesaurus: "Marksman"". Retrieved November 22, 2016. ^ "Special & Qualification Badges of the ADF 2002 Page 2". Digger History. Retrieved 2011-01-23. ^ "Chapter 26 Military Skills Badges". Army Standing Orders for Dress. Australian Army. 1996. ^ John Pike. "FM3-21.11 Chapter 1". Globalsecurity.org. Retrieved 2013-08-17. ^ A. Goodman. "Sharpshooters: The Truth about A.C. Snipers". A. Goodman. Archived from the original on 2015-02-03. Retrieved 2015-06-19. ^ "The Army Marksmanship Unit". ^ "Earning your Appleseed Rifleman Patch". My Knowledge Guy. 2018-05-11. Retrieved 2019-02-26. ^ a b Ayoob, Massad (May–June 2010). "The Appleseed Project" (123). Backwoods Home Magazine. ^ Program, NRA Marksmanship Qualification. "NRA Marksmanship Qualification Program". mqp.nra.org. Retrieved 2019-02-26.